Why pick one restaurant for your dinner plans when you can have over 50? Look no further than here, at the Seaport World Trade Center’s historic Headhouse Concourse for your Friday fun! 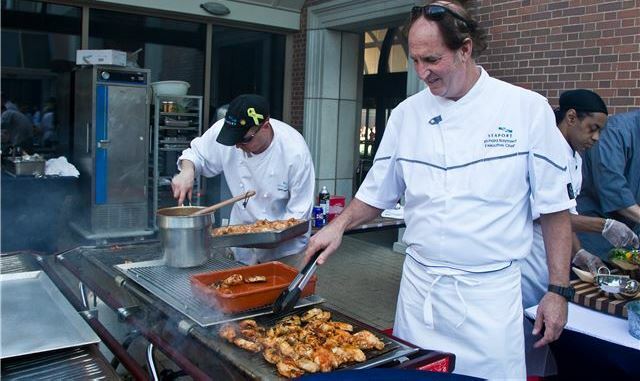 Some of Boston’s top chefs will join together on the outdoor plaza to fire up the grills and serve you their favorite creations in a little friendly competition. Our favorite Seaport Chef trio of Karen Hodson, Richard Rayment, and Robert Tobin will be on hand with homegrown menu favorites. Meanwhile, peruse culinary samplings from Bastille Kitchen, Deuxave, Flour Bakery, and many more! This summer favorite isn’t just any regular night of fun. Along with admission, complimentary beer and wine tastings, and a true taste of Boston, your ticket also helps support Future Chefs. This amazing local organization has the mission to prepare urban youth for employment by teaching skills in the culinary field—thus fostering the next generation of Chefs in Shorts competitors! For tickets, head to https://chefsinshorts2016.eventbrite.com, and we’ll see you Friday for a night of grilling and fun!